Leonardo Da Vinci (April 15, 1452– May 2, 1519) was artist, humanist, scientist, philosopher, inventor, and naturalist during the Italian Renaissance. His genius, says his biographer Walter Isaacson, was the ability to marry observation with imagination, to apply that imagination to intellect and its universal nature. Known For: Renaissance-era painter, inventor, naturalist, philosopher, writer. Born: April 15, 1452, Vinci in Tuscany, Italy. Parents: Piero da Vinci and Caterina Lippi. Died: May 2, 1519, in Cloux, France. Education: Formal training limited to "abacus school" in commercial math, apprenticeship at the workshop of Andrea del Verrocchio; otherwise self taught. Leonardo Da Vinci was born in the village of Vinci in Tuscany, Italy, on April 15, 1452, the only child of Piero da Vinci, a notary and eventually Chancellor of Florence, and Caterina Lippi, an unmarried peasant girl. He is properly known as "Leonardo" rather than "da Vinci," although that is common form of his name today. Da Vinci means "from Vinci" and most people of the day who required a last name were given it based on their place of residence. Leonardo was illegitimate, which, according to biographer Isaacson, may well have assisted his skill and education. He was not required to go to formal school, and he passed his youth in experimentation and exploration, keeping careful notes in a series of journals which have survived. Piero was a well-to-do man, descended from at least two generations of important notaries, and he settled in the town of Florence, marrying Albierra, the daughter of another notary, within eight months of Leonardo's birth. Leonardo was raised in the da Vinci family home by his grandfather, Antonio, and his wife, as well as Francesco, Piero's youngest brother only 15 years older than Leonardo himself. In 1464, Albierra died in childbirth—she had no other children, and Piero brought Leonardo to live with him in Florence. There Leonardo was exposed to the architecture and writings of the artists Filippo Brunelleschi (1377–1446) and Leon Battista Alberti (1404–1472); and it was there that his father got him an apprenticeship to the artist and engineer Andrea del Verrocchio. Verrocchio's workshop was part art studio and part art shop, and Leonardo was exposed to a rigorous training program, that included painting, sculpture, pottery, and metal working. He learned the beauty of geometry and the mathematical harmony that art can leverage; and it was here that he learned chiarroscuro, and developed the sfumato technique he would become famous for. When his apprenticeship ended in 1472, Leonardo registered in the Florentine painter's confraternity, the Compagnia di San Luca. Many of the works he did in Verocchio's workshop were often completed by several of the students and/or the teacher, and it is clear that by the end of his tenure, Leonardo had surpassed his master. Verocchio's workshop was sponsored by the Duke of Florence, Lorenzo de' Medici (1469–1492) also known as Lorenzo the Magnificent. Some of the works painted by Leonardo in his twenties include the Annunciation and the Adoration of the Magi, and the portrait of Ginevra di Benci. When Leonardo turned 30, he was sent by Lorenzo on a diplomatic mission to bring a lute in the shape of a horse's head that he himself had crafted to be given to Ludovico Sforza, the powerful Duke of Milan. With him was Atalante Migliorotti (1466–1532), the first of his long-term companions, who acted as a friend, assistant, secretary, and romantic partner. When Leonardo arrived in Milan, he sent a letter to Ludovico, a letter that was more or less a job application, laying out in detail the type of job he envisioned being useful to the Duke: military and civil engineering. Instead, Leonardo ended up an impresario, producing elaborate pageants for the royal court such as the "Masque of the Planets." He designed scenery and costumes and developed fantastic mechanical elements for the plays that would fly, descend or animate for the audience. In this role, he was part court jester: he sang and played the lute, told stories and fables, played pranks. His friends described him as gentle and entertaining, handsome, precise and generous, a valued and beloved companion. It was also during this period that Leonardo began keeping regular notebooks. Over 7,200 single pages exist today, estimated to be one-quarter of his total output. They are filled with expressions of sheer genius: flights of fancy, precognitive sketches of impossible technologies (scuba gear, flying machines, helicopters)' careful, analytical anatomical studies of dissections he performed on humans and animals; and visual puns. In his notebooks and his canvases, he played with shadow and light, perspective, motion, color. His drawings of humans at the time are fascinating: an old warrior with a nutcracker nose and an enormous chin; grotesquely old men and women; and a thin, muscular, curly-haired androgynous figure, the opposite avatar of the old warrior who would provide centuries of delight and speculation for art historians. Of course, he painted while he was in Milan: portraits included several of Ludovico's mistresses, The Lady with the Ermine and La Belle Ferronnière; and religious works such as Virgin of the Rocks and the astonishing Last Supper. He also made the famous drawing Vitruvian Man, the best of numerous attempts of the day to illustrate what the Roman architect Vitrivius (ca 80–15 BCE) meant when he said the layout of a temple should reflect the proportions of a human body. Leonardo ditched most of Vitrivius's measurements and calculated his own ideal of perfection. In 1489, Leonardo finally earned the job he had wanted in 1482: he received an official court appointment, complete with rooms (albeit not at Ludovico's castle). His first commission was to make an immense sculpture of the Duke of Milan's father Francesco sitting on a horse. He made the model of clay and worked for years planning the casting, but never completed the bronze sculpture. In July of 1490, he met the second companion of his life, Gian Giacomo Caprotti da Oreno, known as Salai (1480–1524). By 1499, the Duke of Milan was running out of money and no longer consistently paying Leonardo, and when Louis XII of France (1462–1515) invaded Milan, Ludovico fled the city. Leonardo stayed in Milan briefly—the French knew him and protected his studio from the mobs—but when he heard rumors that Ludovico was planning to return, he fled home to Florence. When Leonardo returned to Florence, he found the city still shaken from the after-effects of the brief and bloody rule of Savonarola (1452–1498), who in 1497 had led the "Bonfire of the Vanities"—the priest and his followers collected and burned thousands of objects such as artworks, books, cosmetics, dresses, mirrors, and musical instruments as forms of evil temptations. In 1498, Savonarola was hanged and burned in the public square. Leonardo was a different man when he returned: he dressed like a dandy, spending almost as much on clothing as he did on books. His first patron was the notorious military ruler Cesare Borgia (1475–1507), who conquered Florence in 1502: Borgia gave Leonardo a passport to travel wherever he needed, as his personal engineer and innovator. The job only lasted about eight months, but during that time Leonardo built a bridge supporting a garrison of troops out of a pile of lumber and nothing more. He also perfected the art of maps, drawing villages as they would be seen from the air, accurate, detailed birds-eye views of cities measured with a compass. He also established a friendship with Niccolo Machiavelli (1469–1527), who would base his classic The Prince on Borgia. By 1503, though, Borgia was running amok, requiring mass executions in the towns he occupied. 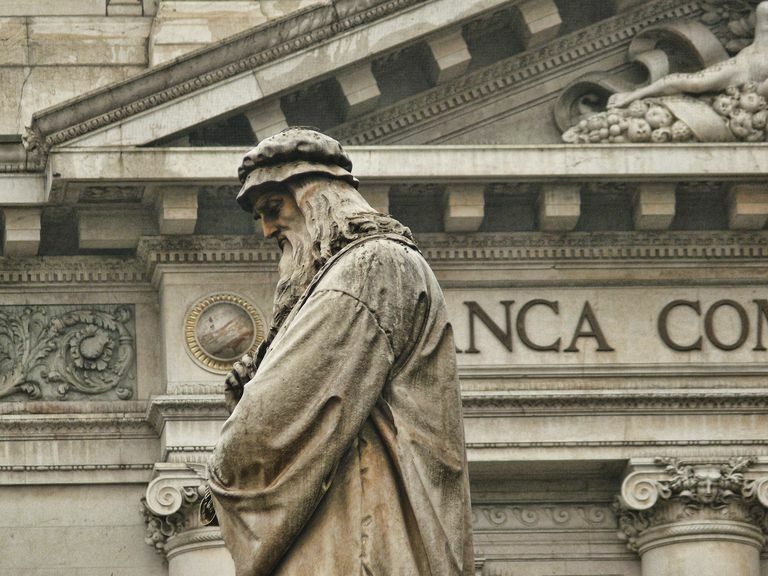 At first, Leonardo seemed oblivious, but when Machiavelli left, so did Leonardo: back to Florence. In Florence, Leonardo and Machiavelli worked on an astonishing project: they planted to divert the Arno river from Pisa to Florence. The project got started, but the engineer changed the specs and it was a spectacular failure. Leonardo and Machiavelli also worked on a way to drain the Piombino Marshes: water, the movement of it, the force of it, was a fascination for Leonardo throughout his life, but the marsh project was also not completed. Artistically, Florence had a huge drawback: Leonardo had acquired a nemesis, Michelangelo. Twenty years younger, but although as gay as Leonardo was, unlike Leonardo, Michelangelo was a pious Christian convulsed by agony over his nature. The two artists' communication devolved into a bitter feud. The two men were each commissioned to do battle scenes: hung in separate galleries, the paintings were depictions of frenzied faces, monstrous armor, and mad horses. Isaacson suggests that the upshot of the war of the battle scene was useful to both artists because they were now both luminaries, rather than interchangeable parts. From 1506–1516, Leonardo wandered back and forth between Rome and Milan; another one of his patrons was the Medici Pope Leo X (1475–1521). In 1506, Leonardo adopted Francesco Melzi, the 14-year-old son of a friend and civil engineer, as his heir. Between 1510 and 1511, Leonardo worked with anatomy professor Marcantonio della Torre, whose students dissected humans while Leonardo made 240 meticulous drawings and wrote 13,000 words of description—probably more, those are what have survived. But the professor died of the plague, ending the project before it could be published. And of course he painted: his masterpieces during this period in his life include the Mona Lisa (La Gioconda); The Virgin and Child with St. Anne, and a series of images of Salai as St. John the Baptist and Bacchus. In 1516, Francis I of France commissioned Leonardo for another astounding, impossible task: design a town and palace complex for the royal court at Romorantin. Francis, arguably one of the best patrons Leonardo ever had, gave him the Chateau de Cloux (now the Clos Luce). Leonardo was by now an old man, still productive—he made 16 drawings over the next three years, even if the city project was not completed—but he was visibly ill and had likely suffered a stroke. He died on May 2, 1519, at the Chateau. Clark, Kenneth and Martin Kemp. "Leonardo da Vinci: Revised Edition." London, Penguin Books, 1989. Isaacson, Walter. "Leonardo Da Vinci." New York: Simon & Schuster, 2017. Farago, Claire. "Biography and Early Art Criticism of Leonardo da Vinci." New York: Garland Publishing, 1999. Nicholl, Charles. "Leonardo da Vinci: Flights of the Mind." London, Penguin Books, 2005.